We’d love your help. Let us know what’s wrong with this preview of She Spoke by Kathy MacMillan. When the world tells you to stay quiet, do you listen, or do you speak up? In She Spoke: 14 Women Who Raised Their Voices and Changed the World, with the touch of a button readers can hear Dr. Mary Mcleod Bethune, Dolores Huerta, Dr. Maya Angelou, Dr. Jane Goodall, Shirley Chisholm, Susan Shown Harjo, Hilary Rodham Clinton, Leymah Gbowee, Dr. Temple Grandin, Justice Sonia When the world tells you to stay quiet, do you listen, or do you speak up? In She Spoke: 14 Women Who Raised Their Voices and Changed the World, with the touch of a button readers can hear Dr. Mary Mcleod Bethune, Dolores Huerta, Dr. Maya Angelou, Dr. Jane Goodall, Shirley Chisholm, Susan Shown Harjo, Hilary Rodham Clinton, Leymah Gbowee, Dr. Temple Grandin, Justice Sonia Sotomayor, Tammy Duckworth, Dr. Joanne Liu, Abby Wambach, and Malala Yousafzai. To ask other readers questions about She Spoke, please sign up. If you think that the world is comprised mainly of Anglo-Saxon women, if you think that you are forced to include Malala and Maya Angelou in a poor effort to appear ''diverse'' while diminishing their offer in our world, if you think that the wife of a ‘’President’’ who caused bloodshed in a European capital in 1999 to cover up his own dirty spots, created by his secretary's unsteady hands (or any other part of her anatomy, I don't know...) should be included in this book next to scientists, writers, activists, if you think that copying other illustrators' style is an acceptable way to create a pseudo-feminist book aimed for middle-graders, you've got it all wrong. Please, learn some History. Google the word. While I was familiar with some of them, what makes this book a must read is not just the knowledge you glean about their lives; it is the two questions at the end of each vignette that inspires reflection and, hopefully, action. This one is a super quick read with vibrant illustrations on 14 women that raised their voice and make changes for their environment and the world. The length of each features and the language used really fits their target audience and the women featured here are pretty diverse as some of them are disabled, non-white, lesbian, and autistic. This thirty-two-page hardbound with a built-in battery-operated recorded speaker targets children ages six to eight years old who are interested in women who made a difference in history by speaking out. With no scary scenes, the colorful portraits and illustrations “No matter who you are, you have the right to speak up. 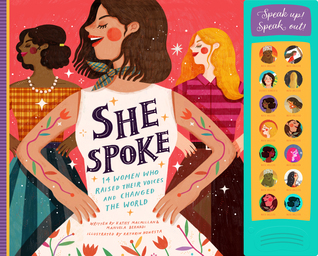 The world needs your voice,” the introduction states in Kathy Macmillan and Manuela’s children’s book, She Spoke: 14 Women Who Raised Their Voices and Changed the World. This thirty-two-page hardbound with a built-in battery-operated recorded speaker targets children ages six to eight years old who are interested in women who made a difference in history by speaking out. With no scary scenes, the colorful portraits and illustrations show women who are noted for taking a stand. Due to complicated wording, the book would be best read out loud to beginner readers. This oversized-book covers fourteen mostly-American women who have made a difference. With their portraits on the left side of the pages with quick facts, the right sides include biographical paragraphs, readable quotes, and sidebars promoting how the reader can speak up. The far right side has thumbnail pictures of each woman that, when pressed, vocalize their quotes. Women included are Mary Mcleod Bethune, Dolores Huerta, Maya Angelou, Jane Goodall, Shirley Chisholm, Suzan Shown Harjo, Hillary Rodham Clinton, Leyman Gbowee, Temple Grandin, Sonia Sotomayor, Tammy Duckworth, Joanne Liu, Amy Wambach, and Malala Yousafzai. Showing young girls can be empowered by learning how other women spoke out or made a statement is important in raising our children. I appreciated the eclectic group of women covered from doctors, lawyers, and politicians to educators, activists, writers, and athletes. Those who do not like books about history and women may not like this read. Some may not be aware of some of the women or feel the selection does not have other more-popular females who are listed at the back of the book such as Susan B. Anthony, Ruth Bader Ginsburg, Helen Keller, Eleanor Roosevelt, or Serena Williams. The biggest issue I had with the book is the voice recording bar as it cannot be turned on or off or changed in volume. Due to the raised plastic section, its placement makes it easy to accidentally engage the speaker’s loud voice. If you are looking for a children’s book that promotes speaking up to be heard, this one that contains not-so-well-known individuals with their audible quotes may be helpful for a book report. I sincerely believe we need more books that teach us about people who inspire us, so we can be motivated to better ourselves each and every day, in each and every way. She Spoke is one such book. Here are my thoughts on this book. This book introduces us to women who are famous, like Hillary Clinton, Dr.Jane Goodall, and Maya Angelou, it also brings to light other lesser-famous women who deserve the spotlight as well, like Dolores Huerta, Leymah Gbowee, and Dr. Temple Grandin. I loved the in I sincerely believe we need more books that teach us about people who inspire us, so we can be motivated to better ourselves each and every day, in each and every way. She Spoke is one such book. Here are my thoughts on this book. I loved the inclusion of a diverse set of women (in spite of the focus being the US); the women included are from different races and cultures, and include differently-abled women as well. Love that the physical book includes snippets of speeches by the featured women. It is just wordy enough so it can be understood by the intended younger audience, and help increase their vocabulary in the process. The illustrations! They are bright, colorful, and perfect for the younger audiences. The book includes further reading references for the featured women, and a list of more women to learn about (again US heavy). The authors do note in the afterword that narrowing it down to fourteen women was the hardest thing to do. While this is labeled as ‘women around the world’ it is US-heavy (10/14). It could have been just a bit longer. Additional thought (based on the cons above): it could have easily included a few more women from around the world (in addition or instead of), making it more realistically ‘world’, and longer (if in addition) in the process! With the caveat of my additional thought above, I enjoyed reading about the women featured in the book – words and illustrations. A book that will be a good and inspiring addition to home and school libraries, especially in the US. I have been reading this book to my 3yo daughter almost every night. Hearing this diverse group of women in their own voices is incredible. My daughter loves to press the buttons that match the pictures on each page and I don't mind listening to "women's rights are human rights and human rights are women's rights" multiple times a day. Delightful - this is a lovely book to hold and read, which stunning illustrations. The option to hear voices is a wonderful feature.